Glucose Assay Kit ab102517 provides direct measurement of glucose in biological samples. It is particularly suitable for serum and urine samples since it is unaffected by reducing substances, which can interfere with detection in oxidase-based kits. In the glucose assay protocol, glucose is specifically oxidized to generate a product which reacts with a dye to generate color (λ = 450 nm) whose intensity is proportional to glucose concentration. The method is rapid, simple, sensitive, and suitable for high throughput. The assay is also suitable for monitoring glucose level during fermentation and glucose feeding in protein expression processes. The kit can detect glucose concentrations in the range of 20µM-10mM. Glucose (C6H12O6; FW: 180.16) is a ubiquitous energy source in most organisms, from bacteria to humans. The breakdown of carbohydrates produces mono- and disaccharides, most of which is glucose. Through glycolysis and TCA (citric acid cycle), glucose is oxidized to eventually form CO2 and water, generating the universal energy molecule ATP. Glucose is a primary source of energy for the brain and a critical component in the production of proteins and in lipid metabolism and therefore measurement of glucose level is a key diagnostic parameter for many metabolic disorders. Glucose measured in biological fluids. Human samples diluted 20-80 fold. Mouse samples diluted 1-27 fold. Our samples are not compatible with the oxidase/peroxidase-based glucose assay ab65333. What is the principle of the ab102517 assay? The main difference between these two glucose assays is that in ab65333 the probe reacts with hydrogen peroxide and gets oxidized to produce colored compound detectable at 570nm or at Ex/Em 535/587nm. In ab102517, the probe reacts with NADH (produced during glucose dehydrogenation in the first step) and forms a colored product measured at 450nm. Assay ab65333 can measure 1uM-10mM glucose. The additional sensitivity in ab65333 is achieved in the fluorometric measurement of the assay. Assay ab102517 can measure concentrations within the range of 20uM-10mM. We have fermentation process and we need monitoring glucose in that process. 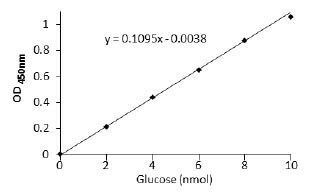 Expected concentracion of glucose is 0,1 - 3%. We found two type test kits ( Glucose Assay Kit andGlucose Detection Kit) ). Please send me commercial offer for both and please recommendone that will match to our needs. I can confirm I would suggest Glucose Detection Kit ab102517or ab65333 Glucose Assay Kitswill be suitable for detection andquantification of glucose in the culture samples. I have put information below regarding the sensitivity and detection range of the kits, I can suggest to review this to decide which kit is best for your experiments (I am sorry we do not have concentration expressed as a percentage, I am not sure what this would be). https://www.abcam.com/index.html?datasheet=102517 (or use the following: https://www.abcam.com/index.html?datasheet=102517). https://www.abcam.com/index.html?datasheet=65333 (or use the following: https://www.abcam.com/index.html?datasheet=65333). I hope this will be helpful to you. Please do not hesitate to contact me if you have any further questions. One of our customers is interested in an assay kit for Glucose quantification. Could you please go into details regarding the differences between products ab65333, ab102517, their usage, sensitivity and advantages. Are both kits available in stock? Thakn you for your enquiry. We have a lot of ab65333 in stock. We currently have 2 of ab102517 in stock.